For over 30 years the handmade artistry has provided the perfect place to buy a unique gift and wonderful treasures. Held over Mother's Day weekend this is relaxing place to spend the day with Mom and buy her a unique gift. The Fair is free to the public. 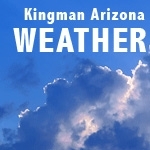 The Kingman Route 66 Rotary Club Foundation will be hosting the Festival of the Arts for 2012 at Centennial Park, 3333 Harrison Street, Kingman, Arizona. The festival will offer a wide variety of local artisans and vendors displaying and selling their high-quality handmade arts and crafts including works from painters, ceramic and mixed medial artists, photographers, jewelers, bead crafters and more.